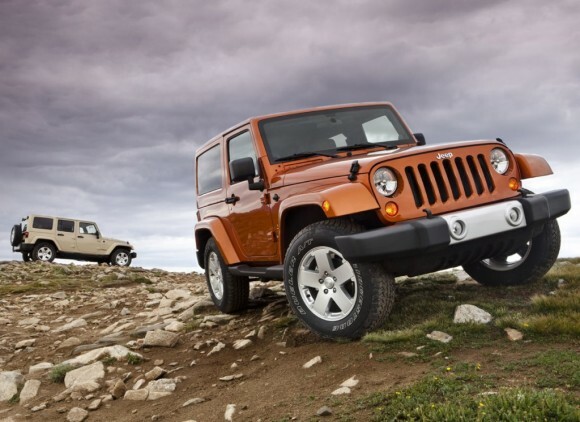 Chrysler has released info on the new 2011 Jeep Wrangler and Wrangler Unlimited. Jeep continues to refine the successful Wrangler formula by combining its legendary, benchmark capability with an all-new interior that delivers rich styling with significantly upgraded touch surfaces, occupant comfort and versatility, and a premium appearance courtesy of an all-new body-color hard top for the popular Sahara model. All-new steering-wheel controls allow the driver to operate the radio, cruise control, hands-free phone and other vehicle functions while keeping hands on the wheel. A new USB device interface connects to storage devices (thumb drives and most MP3 players) for use with the vehicle’s Media Center, which now includes streaming Bluetooth audio. More 12-volt accessory outlets have been added and a new 110-volt outlet is available to provide power similar to AC outlets in the home. In line with traditional Jeep design, hex-head bolts are utilized throughout the interior, and are used to mount a “Jeep, Since 1941″ inlay onto the new passenger grab handle.